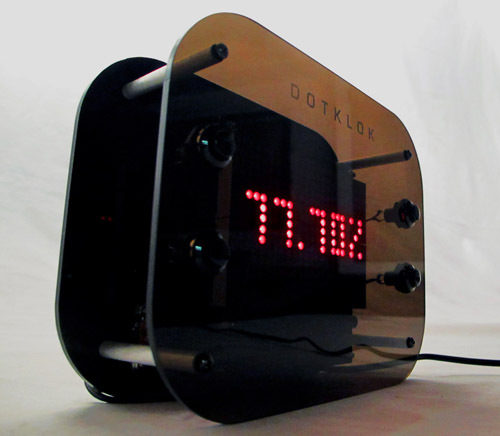 Welcome to the official DOTKLOK page; this is where you can find all the latest documentation and source files for DOTKLOK. 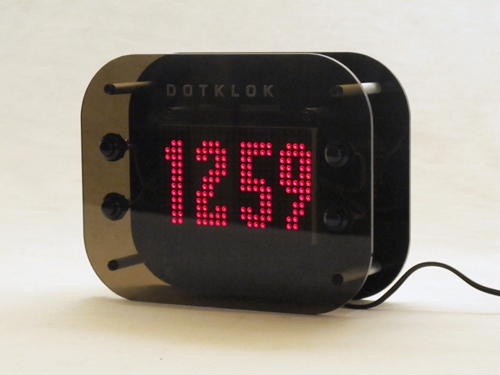 DOTKLOKs are in stock and currently shipping. In addition to kits, bare PCBs are now available as well. Version 1.5 of the code is the most current, which added a scrolling text time; unfortunately a few of the previous animations were removed to make room for this mode, so version 1.4 has all the animations except the new scrolling text time. 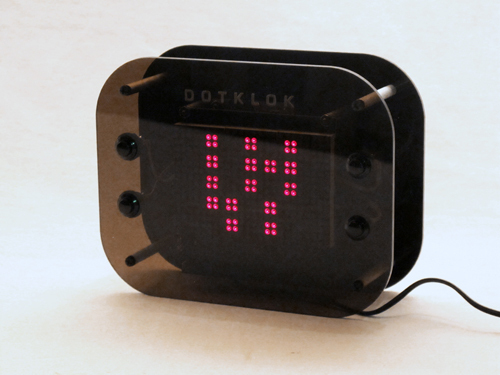 Of course, you can always program your DOTKLOK to have just the animations you want. A blog/tutorial on this will be up shortly! 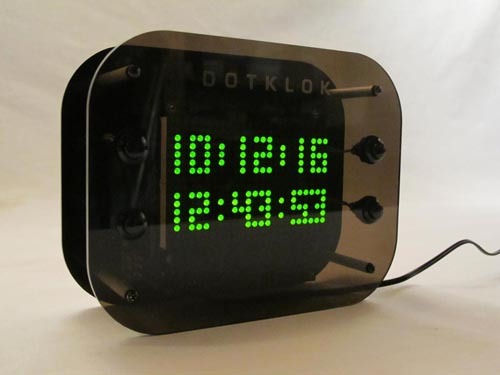 So for support questions asking and answering, feature + animation suggestions, and sharing software + hardware mods, there's now a DOTKLOK forum. 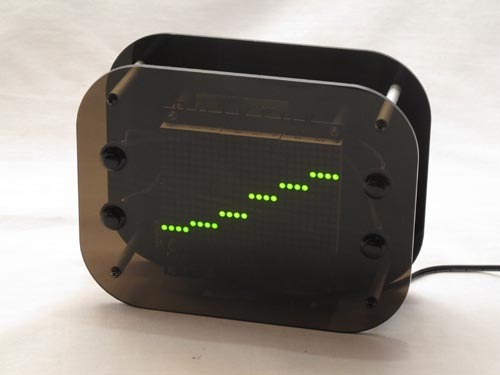 The passing of time is depicted with numbers and abstract/geometric patterns such as Morse code and minimal analog clock faces, and includes animations inspired by classic video games such as Pong, Tetris, Pacman, and Space Invaders. An optional "random mode" changes the animation each day at midnight so you’re greeted with a different animation each morning. 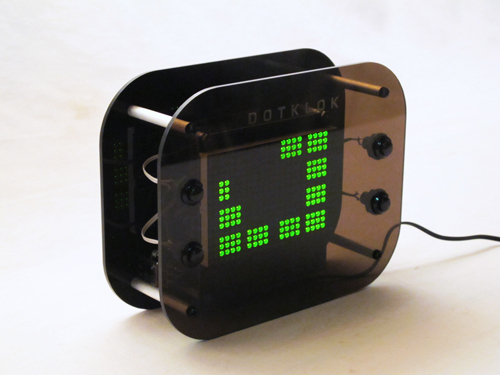 The 24 x 16 pixel screen makes for a large, clear time display. A simple button interface is used to set the date and time, and to select from the various display animations. 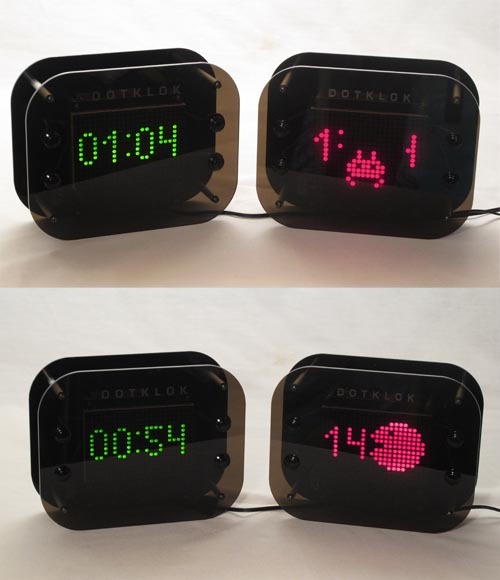 When in “random mode” the clock switches to a different animation each day at midnight so that users can experience a “new” clock each day. The stylish, minimal enclosure is made from laser-cut acrylic panels. 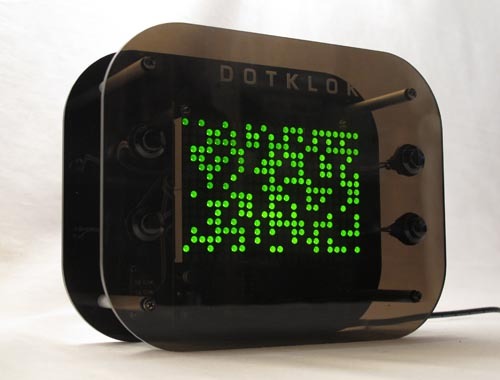 The inspiration for DOTKLOK was to combine in one clock a variety of ways to show time — such as with words, graphics, or retro video game displays — while providing a platform on which others can further develop unique timepieces. 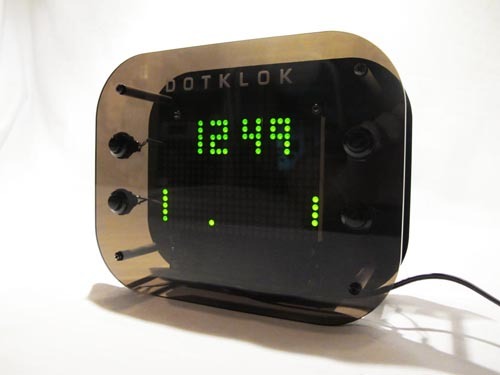 DOTKLOK is built around the well-known ATmega328 microprocessor running the Arduino bootloader, making it easily customized and updated by owners. 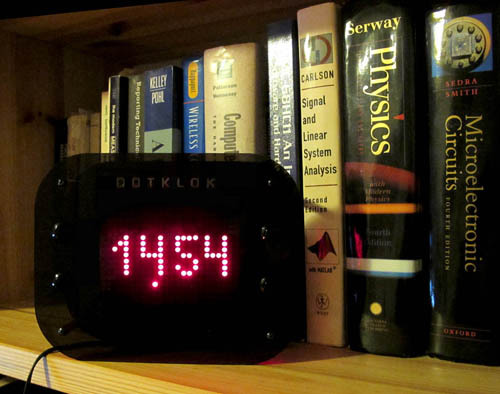 A dedicated real-time clock (RTC) chip tracks the time and date even in the absence of power thanks to a small back-up battery. 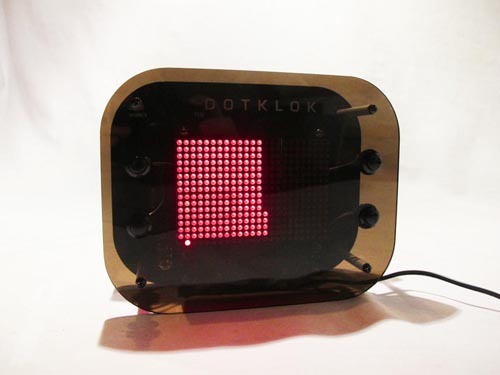 Also, because of the open source nature of the project, DOTKLOK can be re-purposed for other uses altogether, such as a low-fi video game platform. 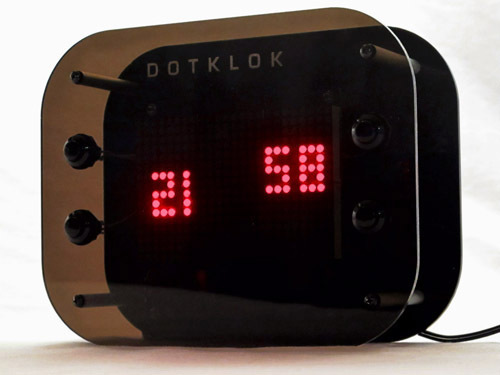 DOTKLOK is available for purchase as a kit or fully assembled, with either a red or green LED screen. All hardware plans, schematics, source code, and assembly + useage instructions are available below. The kit is easily assembled with beginner's soldering experience since all the parts are through-hole. 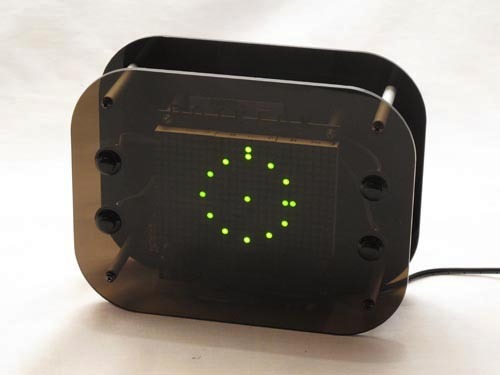 The entire clock can be put together in a few hours (or as little as 90 minutes for experienced kit builders) by following the illustrated assembly guide. Red or green LED versions, either as kits or fully assembled are available through my Etsy shop. Bare PCBs are also now available. 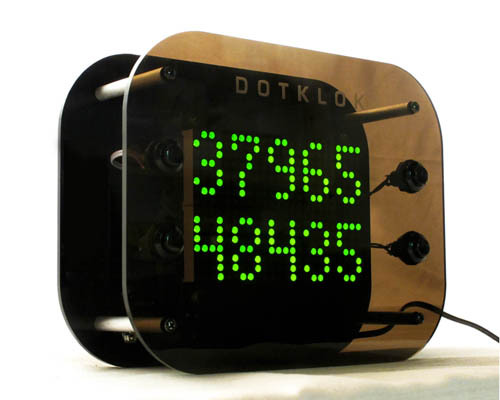 Assembly video: coming when I have a chance to edit the footage; in the meantime, here's a timelapse video of a DOTKLOK build. 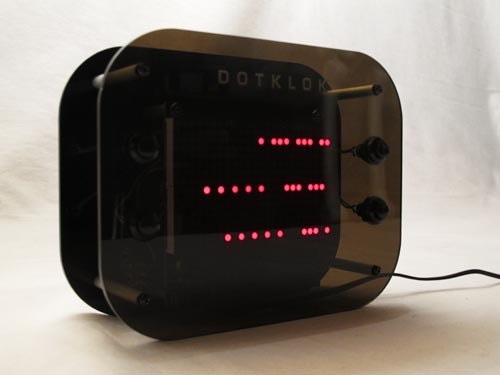 To ask questions about assembling or using your DOTKLOK, make feature and animation suggestions, or share hardware + software mods, head on over to the DOTKLOK forum. All contents herein © 2010-2011 andrew o'malley. Photos by andrew + deborah o'malley.